Yup, the book we have all been waiting for is just about here. 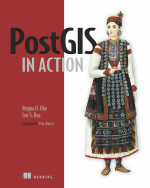 Next Wednesday PostGIS in Action will hit the shelves. I’ve been reviewing it over the last year or so and let me just say it is full of awesome. I can’t say enough that everyone who uses or wants to use PostGIS needs to get this.